"All we want to do is to tell Tony Blair what we think which is he should bring the lads home - they need to be with their families. They don't need to be shot at in Iraq." The words of Christine Brierley, 58, from Batley, West Yorkshire, echo those of all the family members of soldiers killed in Iraq who gathered in Whitehall on Wednesday. Her son L/Cpl Shaun, 28, "a big, bluff Yorkshire man", died after his Land Rover was involved in a road accident 10 days after the war in Iraq began. "He was the 25th British soldier to die," says Mrs Brierley, "not that that makes any difference." Relatives at the demonstration, organised by Military Families Against The War, have come for a number of different reasons. 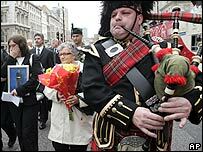 They have come to remember their loved ones and, more importantly, to make sure they are not forgotten. 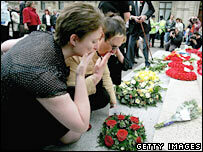 They have come to lay flowers and wreaths at the Cenotaph. But they say the main reason they have gathered is to put pressure on Prime Minister Tony Blair to speak to them in person. The event begins with the short march by about 100 people from the Houses of Parliament to the Cenotaph, led by a lone piper. Marching alongside the friends and families of dead soldiers are ex-servicemen, former MPs Tony Benn and Martin Bell and members of the Stop the War Coalition. Among the bereaved, the sense of camaraderie is overwhelming. When the event ends, there are hugs of farewell as they go their separate ways. The affection is palpable and it is clear that strong friendships, and bonds borne out of common experience, have been made in the most unfortunate of circumstances. Some head to the pub together, seeking solace after an emotional afternoon. Earlier, after laying floral tributes at the Cenotaph, some of the relatives are let through the security gates at Downing Street to hand in their petition to No 10. They want Mr Blair to pull UK troops out of Iraq, because, they say, an "illegal and unjust war" is being fought. But much more than that - for the time being - they want to be given the chance to speak to Mr Blair to tell them why they think he must bring UK troops home. 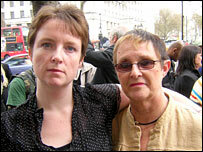 "Today was important because it was our chance to tell the public that Tony Blair still refuses to meet with us," says Sarah Chapman, who is at Westminster with her mother Di O'Connor. Ms Chapman's brother Sgt Bob O'Connor died at the age of 38 when the aircraft he was travelling was shot down near Baghdad. "Why is Tony Blair running? What's he scared of - we're not going to manhandle him." All Ms Chapman wants, she says, is the chance to meet Mr Blair in person to tell him about the experiences of her family and the other families who have lost loved ones in Iraq. When asked to be in a photograph, Mrs O'Connor says she hates having her picture taken. 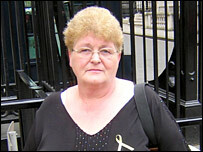 But she and her daughter say they will go to great lengths to keep their campaign and the memory of Sgt O'Connor alive. Members and supporters of Military Families Against The War have been backed in their campaign by a number of MPs, some of whom they met at the House of Commons ahead of their visit to Downing Street. In Parliament on Wednesday, MP for Liverpool and West Derby Bob Wareing challenged Mr Blair to meet the relatives. "Would you spare five or ten minutes to meet them?" Mr Wareing asked the prime minister. Mr Blair replied: "I yield to nobody, nobody, in my support and in my admiration for the work that the soldiers in Iraq do. "It is also important, however, from my perspective, and also I believe from the perspective of those who are serving out in Iraq, that they know that we are fully behind the work that they are doing there. "They are there with a United Nations resolution, they are there with the full support of the Iraqi government, and I believe at this moment it is important that they know that they are doing a job that is right and worthwhile and is absolutely necessary." The relatives, meanwhile, say they will continue campaigning for a meeting with the prime minister. "He's not going to listen," says Mrs Brierley just before she heads to the pub with her friends from Military Families Against The War. "But I will keep trying until the day I die."